Running a multinational site is a responsible thing to do. But sometimes it's easy to forget to put hreflang tags where necessary. It's also easy to get confused on how to implement hreflang correctly. You could check thousands of pages manually and rely on your best efforts. But why make things so complicated? Let our Site Audit tool take care of it! The first and most valuable update is now available in the Issues tab. As you may be aware, if you run a multinational site, Google now requires you to indicate links to multiple language versions of all of your site's pages. And this can obviously be a real source of errors that could cause trouble with your site indexing. Site Audit offers two new checks that will take care of the problem described above. 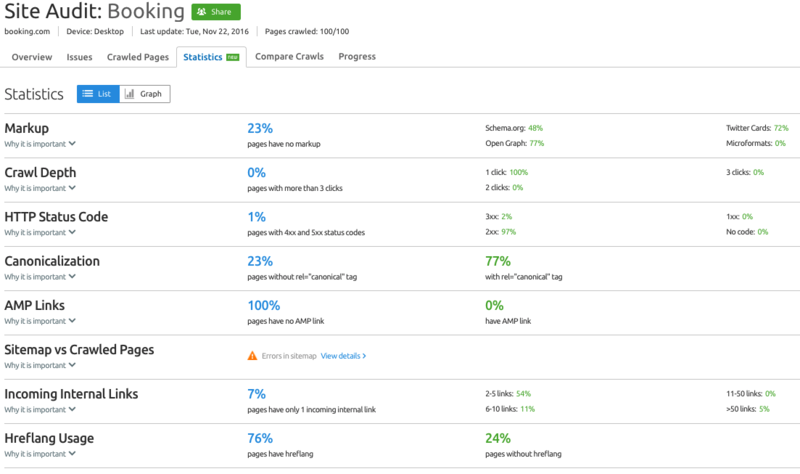 The second update: our Site Audit tool is now able to check every single page of your site for hreflang tags and display the results in the Statistics report. Clicking on 'Pages without hreflang' will take you to the 'Crawled pages' report, where you'll be able to see which of your pages are missing hreflang tags. Now that your multinational site is fully protected, you can rest assured your users will always land on the correct language version of your website. Stay tuned - more updates are coming really soon! Anymore questions? Feel free to ask them by sending us an email at [email protected].